Are you overworked and overstressed? Are you doing your best but finding professional success and personal fulfillment frustratingly difficult to attain? If it seems like you work hard but never get anywhere, maybe the problem is something within you. Maybe the limitations holding you back come from inside you, not from the outside world. Zero Limits presents a proven way to break through those self-imposed limitations to achieve more in life than you ever dreamed. If it seems like you work hard but never get anywhere, maybe the problem is something within you. Maybe the limitations holding you back come from inside you, not from the outside world. Zero Limits presents a proven way to break through those self-imposed limitations to achieve more in life than you ever dreamed. Take it from Joe Vitale. He was once homeless. Now, he's the millionaire author of numerous bestselling books, an Internet celebrity, and an in-demand online marketing guru. What happened to create all of that success? How did he make it happen? Was it hard work, divine providence, or both? The answer may surprise you. It wasn't until he discovered the ancient Hawaiian Ho'oponopono system that he finally found truly unlimited success. Take it from Joe Vitale. He was once homeless. Now, he's the millionaire author of numerous bestselling books, an Internet celebrity, and an in-demand online marketing guru. What happened to create all of that success? How did he make it happen? Was it hard work, divine providence, or both? The answer may surprise you. It wasn't until he discovered the ancient Hawaiian Ho'oponopono system that he finally found truly unlimited success. Updated for modern times, Ho'oponopono is a self-help methodology that removes the mental obstacles that block your path, freeing your mind to find new and unexpected ways to get what you want out of life. It not only works, but it works wonders--both professionally and personally. It works so well in fact, that Vitale had to share it with the world, so that others could experience the fulfillment and happiness he feels every day. 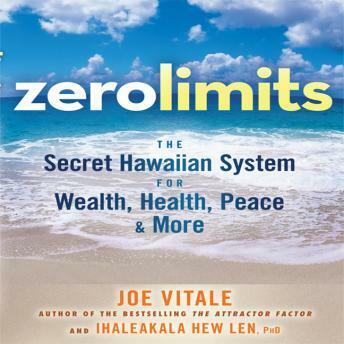 Teaming up with Dr. Ihaleakala Hew Len, master teacher of modern Ho'oponopono, Vitale shows you how to attain wealth, health, peace, and happiness. Vitale and Len walk you through the system, helping you clear your mind of subconscious blocks so that destiny and desire can take over and help you get what you truly want from life. It clears out unconsciously accepted beliefs, thoughts, and memories that you don't even know are holding you back. Imagine wiping your mind's slate clean and starting over without preconceived notions, so you can live in a world of daily wonder. Imagine if anything and everything were possible. In fact, everything is possible when you look at the world free of mental constraints. This book is a key that opens your life to a new universe of possibility and accomplishment--a universe with Zero Limits. Dr. Hew Len has tremendously deep rooted my spiritual start in a very practical way without bringing any religious belief into existence. Thank you for sharing Hooponopono to the world. This book opened up a new idea that really resonated with me. I enjoyed the lessons it taught and feel it's definatley heading in a direction I would like to go in. I loved this book. People need to stop being negative. Not much of a book. Sounds like Joe needs to be a little more inquisitive and not so accepting of stuff people say. Maybe I didn't see it but I am disappointed in the time I spent listening to this book. This book was found to be helpful to me. This was my first audio book experience!! I've walked away with something special! !